Sunifiram (DM-235) is a piperazine derived ampakine-like drug which has nootropic effects in animal studies with significantly higher potency than piracetam. Elagolix is a highly potent, selective, orally-active, short-duration, non-peptide antagonist of the gonadotropin-releasing hormone receptor (GnRHR) (KD = 54 pM). Ceftizoxime Sodium is the sodium salt form of ceftizoxime and a semi-synthetic, broad-spectrum, beta-lactamase resistant, third-generation cephalosporin antibiotic with bactericidal activity. Ceftizoxime Alapivoxil is the alapivalate ester prodrug form of ceftizoxime, a semi-synthetic, broad-spectrum, beta-lactamase-resistant, third-generation cephalosporin with antibacterial activity. 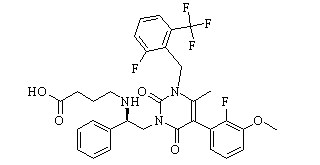 Ceftizoxime is a broad-spectrum, beta-lactamase-resistant, third-generation cephalosporin, binding to and inactivating penicillin-binding proteins (PBPs) located on the inner membrane of the bacterial cell wall. GSK2200150A, identified by high-throughput screening (HTS) campaign, is an anti-tuberculosis (TB) agent. L-Asparaginase is an enzyme that depletes L-Asparagine an important nutrient for cancer cells resulting in cancer/tumor cell starvation. MBP146-78 is a potent and selective inhibitor of cGMP dependent protein kinases. Ceftobiprole is a broad-spectrum cephalosporin with activity against Methicillin-resistant staphylococcus aureus (MRSA) with the MIC90 value of 2 mcg/mL. Ceftobiprole Medocaril is a water-soluble prodrug of ceftobiprole, a pyrrolidinone cephalosporin antibiotic, with bactericidal activity.